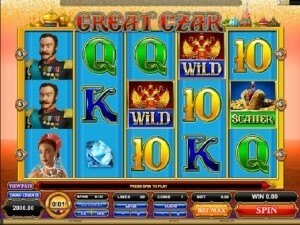 Great Czar is a Microgaming slot machine, themed around Russia’s Great Czars, former rulers of the country in a time when it was an empire, before the early 20th century revolt that overthrew them from power. The game’s design is not very impressive, which is unfortunate since so many slots that are inspired by Russian culture tend to be quite gorgeous. 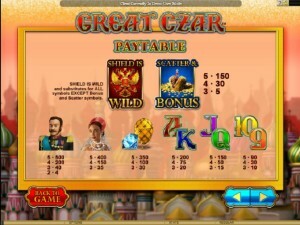 It’s not the case here, perhaps because the slot is an older release from Microgaming. Despite the 30 lines available on its 5 reels, it’s an older looking game, though it manages to scrounge up some wild symbols, scatter symbols and a feature with free spins. It’s both cheap to play, and offering low prizes as a result, of up to $125. 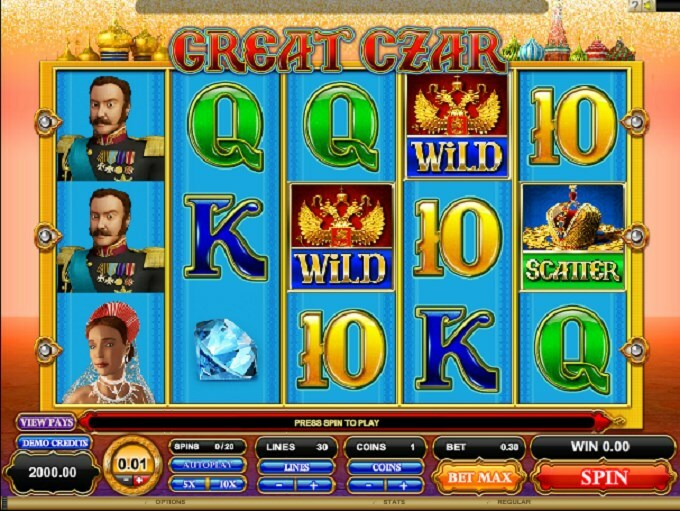 The features of Great Czar include a wild symbol, along with a scatter that acts as a bonus symbol as well, capable of triggering a feature that gives you free spins and multipliers. The Shield is the wild, and on it you will find a red background and a golden eagle with two heads logo. This wild symbol does not award its own prizes, but you can rely on it to get other combinations formed. Its substitution ability allows it to help you out, and it will do so if it lands on a position where another regular icon would be needed to form a combo. The wild can replace only regular symbols, no scatters. The symbol that is both a scatter and a bonus game trigger is the Imperial Crown. This symbol, with the crown of the czar placed on a spread of gold coins, is going to reward you with its prizes by being in random positions, but in at least three locations. Three Crowns will reward you with 5x the bet, four will get you 30x the bet, while the maximum of five will award 150x the bet. This feature gets started when the Bonus Imperial Crown is in 3 to 5 locations, scattered in random positions on the reels. 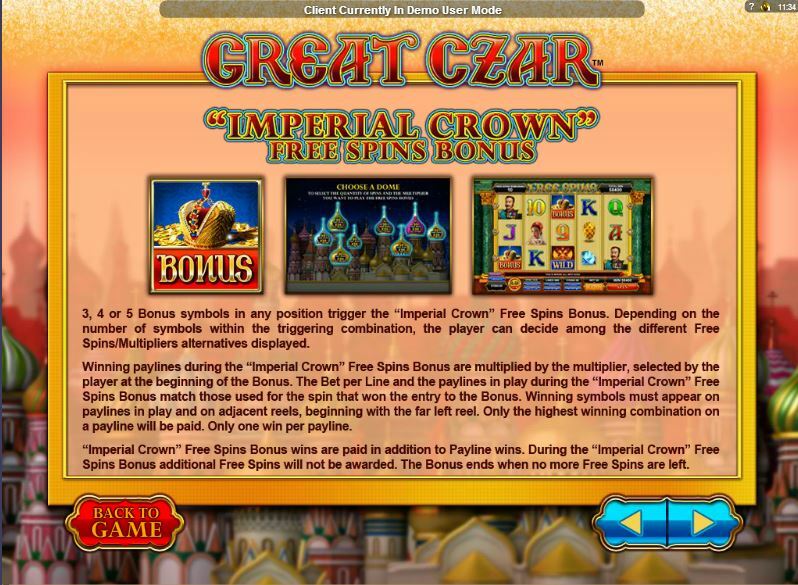 You get to pick a combination of free spins and multipliers, depending on your own preferences and the number of triggering symbols. If there is one great thing about this slot, it would probably be the low cost of the wagers you place in it. You can spend up to $7.50 per spin, using $0.25 line bets. The line bet has in it up to 5 coins, of $0.05 or less. The game’s best symbol will give you 500 times the line bet, which would mean 2,500 coins, but only up to $125. The 150x of the scatter symbol uses the total bet, so in this case the payout goes up to $1,125. The Imperial symbols, the crowns, shields with heraldry on them or the diamonds and the members of the Czar’s family, these are all good choices for the symbols of a game like this. However, they’re all created in low resolution images, which don’t look good as a result. The playing cards are the worst of the lot, simple letters of random colors. Symbols: Shield (wild), Imperial Crown (bonus, 150x bet), Czar (500x), Czarina (400x), Faberge Egg (350x), Ace (200x), King (200x), Queen (150x), Jack (150x), 10 (90x) and 9 (90x). The design is not impressive, though the topic chosen for it is a very good one. It doesn’t pay well, but it doesn’t ask for much either. The features are at least decent, but as you can probably tell by now the overall effect is not an impressive one. 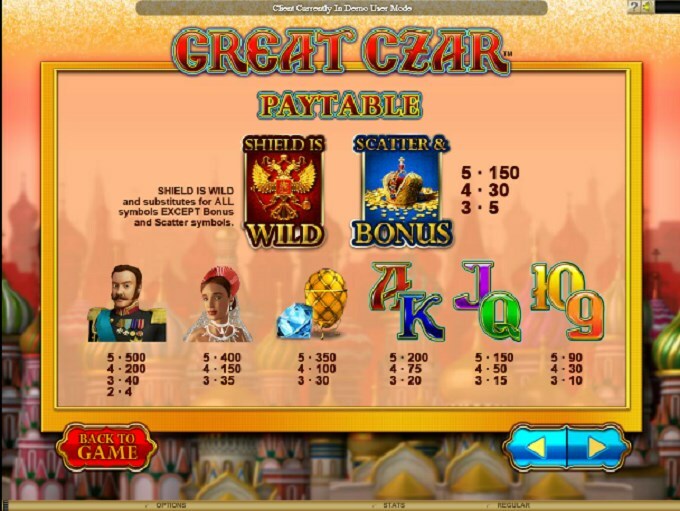 The Great Czar slot machine is offered through the Microgaming platform, so if you want to play it for real or just to practice, look out for casinos that use it.